The other day our little grandson had a big discussion with his mama about who was in charge. Theo, age 2, claimed he was the boss. His mama reminded him that she was in charge. 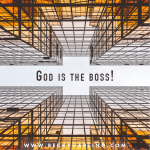 In the middle of the discussion, Joshy, age 6, interrupted by declaring, “Actually, God is the boss!” How can you argue with that? While we had a good laugh as a family over the discussion, it’s a great reminder. Jesus is sovereign. In other words, He’s the boss. Scripture tells us, “I know that you can do all things; no plan of yours can be thwarted” (Job 42:2). “I make known the end from the beginning, from ancient times, what is still to come. I say: my purpose will stand, and I will do all that I please” (Isaiah 46:10). “He (Christ) is before all things, and in Him all things hold together. And He is the head of the body, the church: He is the beginning and the firstborn from among the dead, so that in everything He might have the supremacy” (Colossians 1:17-18). Even though we read these Scriptures, trust is still hard, isn’t it? His sovereignty raises questions like, “What if God’s plan for my life includes suffering? Or what if He allows suffering in the lives of those I love? Can I trust that His plans for me are always good?” I understand. I’ve wrestled with those questions myself. Jesus is good. If God were evil and sovereign, I would feel terrified! But here’s the thing: God is good. All the time. His every intention towards me comes out of the goodness of His heart. He even promises that He will work all things – even my mistakes – for my good (Romans 8:28). As I dwell on His goodness, I find trust a whole lot easier. Jesus loves me. So simple, yet so true. You don’t intentionally hurt someone you love. God’s not out to get me or punish me. He calls me “precious” (Isaiah 43:4). He continually pursues a relationship with me. And the same holds true for you. He loves you. He’s madly and categorically in love with you! He declares you chosen, holy, and dearly loved (Colossians 3:12). He’s on your side, so celebrate His love today! Jesus weeps when I suffer. One of my favorite scriptures is John 11: 36: “Jesus wept.” I, like you, need a Jesus who can crawl into my suffering and sorrow when life is unfair, when tragedy strikes, and when evil threatens. Jesus understands and weeps with you when you lose a loved one, or when someone you love wrestles with cancer, or when a child is hurt. He never shames those who cry. Nope. Instead, He cries with you. I don’t know about you, but when I find myself wrestling with trust, I return to these 3 truths and my ability to trust grows. Steve and I are resting in Italy before we head to Sweden next week for meetings. Please keep praying for the release of the teaching videos for Who Do You Say That I Am?Pray that as women and men view the videos, the Holy Spirit will move in their hearts, drawing them into deeper trust of Jesus! You can order the videos for your group at http://bit.ly/WDYSTIAbook.